It’s this time of year when students and parents turn their thoughts to next year’s classes. A common question we get is whether or not to pursue Honors level work in those classes. The Department has spent a lot of time pondering this question, and we’d like to offer some basic guidelines to help families to make these decisions. Being in school. Our analysis tells us that students who find success at the Honors level are absent no more than 3 times per semester at the most. Doing homework independently. Successful Honors students complete 95% or more of their homework without being nagged by parents or teachers to do so. Being an active participant. Successful Honors students contribute to class discussion regularly and without the teacher prompting them to do so. Being opinionated but with evidence. Successful Honors students are able to form and articulate an opinion and back it up with evidence. They can do this both orally and in writing. Being curious about the world. Successful Honors students are interested in the world around them. They follow current events, consume news items on their own and are interested in talking about them. They have an ambition to see the places they hear and read about. Being a reader. Successful Honors students see reading as enjoyable, not as a burden or a chore. They regularly spend time with books, magazines, newspapers, web articles, etc. Being motivated for their own success. Successful Honors students are self-motivated to: master material; improve their performance; and to work hard every day. Being resilient. Successful Honors students are able to bounce back from set-backs. They have a growth mindset about improving themselves and their performance. They believe in their ability to improve, and they take feedback constructively. Being strong students. Successful Honors students know how to be a student. They are adept at note-taking, test preparation and organization. Being passionate about the social sciences. If there isn’t an interest in the subject matter, why bother taking Honors? Successful Honors students want to know more about the subject and are passionate about the topics the course covers. Of course, not all topics will inspire the same level of passion, but Honors requires a higher level of interest overall. We’d expect to see an Honors student demonstrate a high level of achievement in his or her classes, but we don’t make our recommendations solely on the basis of the grade the student earned in our classes. So if you or your child is contemplating Honors work in the Social Studies, go through the above 10 items and have an honest conversation about them. If you can answer yes to all 10, coupled with strong marks this year, then this seems like an easy choice. If the answer is no to some and yes to others, then include the teacher in the conversation and ask his or her opinion! And if the answer is no to the majority, then Honors is not going to be the path to take next year. There has already been much made of President Trump’s use of Executive Orders in the opening days of his administration. As we have seen, in week one, he issued six Executive Orders, 10 Executive Memoranda, and one Proclamation. That is according to the White House’s website: https://www.whitehouse.gov/briefing-room/presidential-actions, as of this publication. So what exactly are these things? How do they differ from each other, and how do they work? We’d like to offer this information as a way to help members of the BHS community better talk about them from an informed point of view. Firstly, it is important to note that all Presidents issue Orders, Memoranda and Proclamations. Put simply, these are the most immediate tools at a President’s disposal to direct the Executive Branch to work on his agenda and to make public statements of desires and policies. Secondly, it is important to note that none of these tools appear in the Constitution of the United States as a power granted to the President. They have evolved over time as convenient tools that allow the President to direct the attention and efforts of his Cabinet officers and their respective bureaucracies. While not exactly a Constitutional power, the Congressional Research Service considers them to be an inherent, albeit hazy, power of the President. An Executive Order is, according to Merriam Webster’s Law Dictionary, “an order issued by a government’s executive on the basis of authority specifically granted to the executive branch (as by the U.S. Constitution or a congressional act).” This Order does not enter into force until it is printed in the Federal Register. If the Order is within the scope of the powers granted to the Executive Branch under the Constitution, then the Order has the force of law. If it does not, or if it comes into conflict with pre-existing legislation or Constitutional authority, then it will be challenged, and the Supreme Court will have to make a ruling on its applicability. Until such time as this happens, however, the offices of the Executive Branch must comply with the contents of the Order as though it were a law. The Federal Register can be viewed here and in the above link. You will notice, should you click the link, that Executive Orders are numbered sequentially. You will also notice that (as of this writing) the Federal Register has yet to create a Distribution Table for President Trump. As a result, there is a question as to the efficacy of these Orders until such time as they are entered and numbered. This is no doubt a function of time and bureaucracy, however, and will likely be rectified soon. An Executive Memorandum is very similar to the Executive Order, and some have argued that they should both be lumped together and be called “Executive Actions.” However, a Memorandum does not carry the same force of a law, is not sequentially numbered, and is not entered into the Federal Register. In fact, a Memorandum does not even have to be public. It is similar to an Order in that the Memorandum directs members of the Executive Branch to do something in a certain way, or not do something in a certain way. Different Presidents have treated Memoranda in different ways, with some viewing them as equivalent to an Order and others not. The Obama Administration began the practice of making Memoranda publicly available. Lastly, an Executive Proclamation (or Presidential Proclamation as it is commonly known) is a mostly ceremonial statement directed at those outside of the Executive Branch. It does not necessarily carry any force of law, depending upon the content, and whether or not there is Congressional authorization behind it. The President may proclaim a day of mourning, a day of celebration of a person or group or event, for instance. According to the Yale Law Library, Proclamations also encompass Presidential Pardons, which do have the force of law. Proclamations may also make statements of policy, but like the others, are subject to challenge and review should they prove to be unconstitutional. We hope that this is helpful as you go forward and discuss the actions taken by whomever occupies the White House at whatever point in history you feel like arguing about. Our Electives are generally open to all 11th and 12th grade students. 10th grade students may petition the department chair for permission if their schedules allow it. Burlington High School is participating in a pilot program with the DESE to see if the loss of days to snowfall in the winter can be made up. To that end, the Social Studies Department has created a series of projects that students can complete in order to be granted two days worth of snow day relief. These projects all revolve around participation in a civic society at the state and local level. To access these projects, please click the link entitled: Snow Day Work in the banner above. Please note that in order to see the documents describing the project, you will need to be signed into the Burlington Public Schools’ domain. Requests to share the project outside of that domain will not be granted. Students and parents should contact teachers directly with any questions or concerns they may have as they arise. 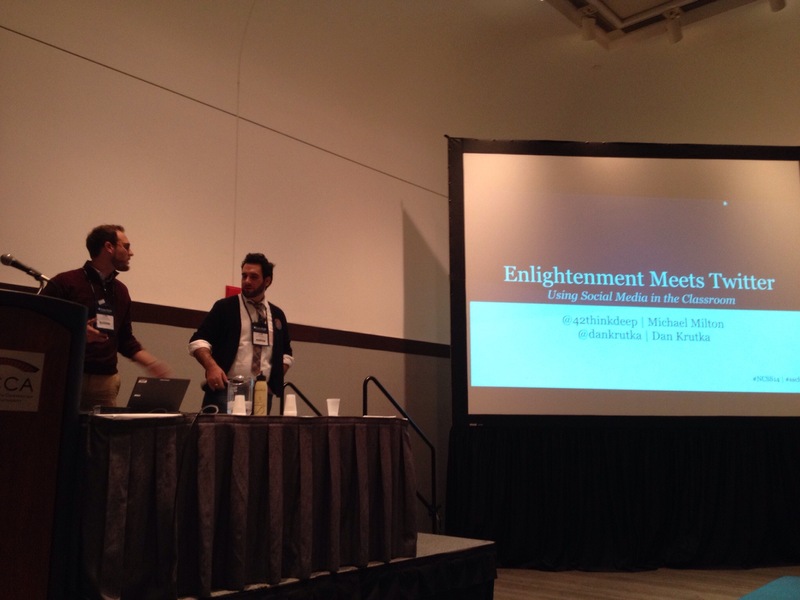 On November 21, Michael Milton, of the BHS Social Studies Department, presented with Dan Krutka at the National Council for the Social Studies Conference in Boston. They presented an activity that Mr. Milton does with his World History classes, merging the Enlightenment thinkers with Twitter. Conference attendees were taken through the activity in groups where they assumed the roles of Voltaire, Hobbes, Locke, Rousseau and Wollstonecraft and then responded to the USA Patriot Act. Today is the final day of Constitution Week, but the Constitution is a document that deserves thought and attention every day! So just because the week is over, don’t stop looking for ways that the Constitution can interact with your daily life! Did you know that the Constitution of the United States is the shortest one in the world? The document drafted in 1787 totaled 4,400 words. The entire original document takes up four pages, each one measuring about 29 by 24 inches (73 by 60 centimeters). With the signature section, there are 4,543 words, and including all of the amendments brings the total up to 7,591. And did you also know that nowhere in the Constitution is the word “democracy” used? The government established by the Founders is a republic, a system of government in which the people elect representatives to do the governing for them! Speaking of the Constitution, there’s an essay competition out there for students to write about the Bill of Rights! The first prize winner will receive $5,000, second prize $3,000, and third prize $1,500! Students that submit essays by November 15, 2014 are also eligible for one of five $100 Early Bird cash prizes. The competition is sponsored by the Bill of Rights Institute, and the entry deadline is December 5, 2014. Happy Constitution Day! On this day in 1787, the Constitution was signed by 39 representatives from the states who chose to send representatives to the Convention. The oldest person to sign the Constitution was Benjamin Franklin (81). The youngest was Jonathan Dayton of New Jersey (26). Today’s Constitution Day came about because of the efforts of Senator Robert C. Byrd of West Virginia, who said when arguing for the creation of the day: “…September 17 is more important to our everyday lives than Columbus Day, more important to our everyday lives than Thanksgiving, more important to our everyday lives than the Fourth of July…” You can read the full text of his speech at the byrdcenter.org’s website linked up here. There’s a national Preamble Challenge today. To participate, record yourself reciting the Preamble to the Constitution (below) and post it to Facebook, Instagram, Twitter, or social media of your choice! Use the hashtag #ConstitutionDay2014 or #preamble or #preamblechallenge. Looks like at least a million other people are doing it today. You should too! There are also hundreds of special naturalization ceremonies going on around the nation to welcome our newest citizens!